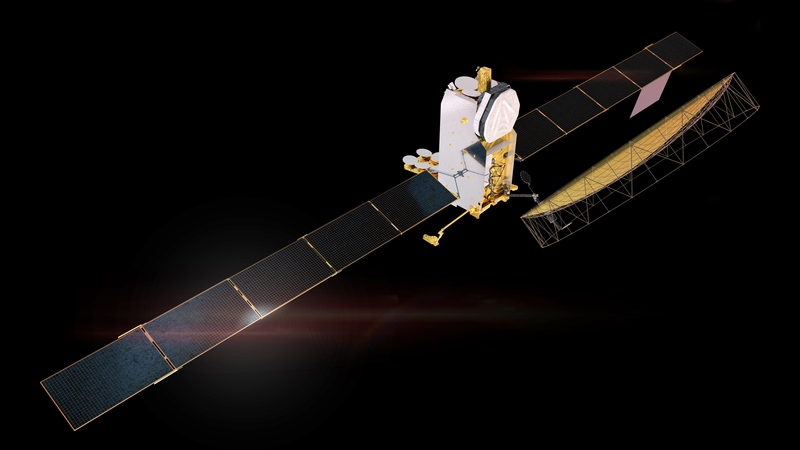 Astro Aerospace, a Northrop Grumman Corporation business, completed a successful Preliminary Design Review (PDR) of the nine-meter L-band reflectors for two Airbus Inmarsat-6 series satellites. «We are proud to support Airbus Defence and Space and the Inmarsat program», said John A. Alvarez, general manager, Astro Aerospace. «Astro Aerospace’s unique AstroMesh technology is particularly well suited for Inmarsat-6’s L-band capacity, which is significantly greater than the capacity of previous satellites and capable of supporting a new generation of more advanced L-band services. AstroMesh deployable mesh reflectors are made of the lightest and stiffest materials available, making them well suited for such missions. I also want to thank the combined Astro-Airbus-Inmarsat team that worked tirelessly to ensure a successful PDR». Astro Aerospace (www.northropgrumman.com/astro) is the leading pioneer of space deployable technology and structures that have enabled critical complex missions to Earth’s orbit, Mars and beyond. Astro Aerospace’s hardware is characterized by its light weight structural design and robust deployment kinematics. Since 1958, Astro Aerospace has successfully deployed technology on hundreds of space flights with a 100 percent success rate, a testament to Northrop Grumman’s commitment to reliability, quality and affordability.